One of the tasks of the Stirling Smith Art Gallery and Museum is to collect and show the works of important Stirling artists. 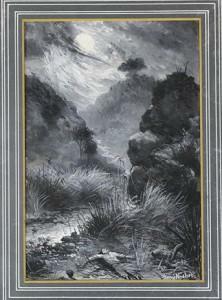 ‘The Nightmare’ is a recently purchased gouache by Stirling born artist and writer James Hume Nisbet (1849 – 1923) who is largely unknown in Scotland today, but is recognised as a significant figure in Australian cultural history. Nisbet was the son of James Nisbet, house-decorator, and his wife Jane, née Hume. He emigrated to Australia at the age of 16. He had an artistic disposition and became an actor at the Theatre Royal in Melbourne, and spent time exploring Australasia, returning to Britain in 1872. He then studied and practised art, moving back to Scotland in 1873, where he married Helen, daughter of the sculptor Andrew Currie who did the Bruce statue on Stirling Castle Esplanade. From 1878 – 1885, he taught drawing at the Watt Institution (now Herriot Watt University). In 1886 he was commissioned by the publishers Cassell & Co. to go back to Australia to draw and write for their publications. In total, Nisbet wrote and illustrated forty-six novels, about half set in Australia. He also wrote four volumes of poetry, five books on art including Where Art Begins (1892), collections of short stories, and travel books. He was the Alasdair Gray of his day, but in an Australian context and a good example of how Stirling people have often shaped the world.